Chicago was incorporated as a city in 1837, near a portage between the Great Lakes and the Mississippi River watershed, and experienced rapid growth in the mid-nineteenth century. The city is an international hub for finance, commerce, industry, technology, telecommunications, and transportation: O'Hare International Airport is the busiest airport in the World; it also has the largest number of U.S. highways and railroad freight. In 2012, Chicago was listed as an alpha global city by the Globalization and World Cities Research Network, and ranks seventh in the world in the 2014 Global Cities Index. 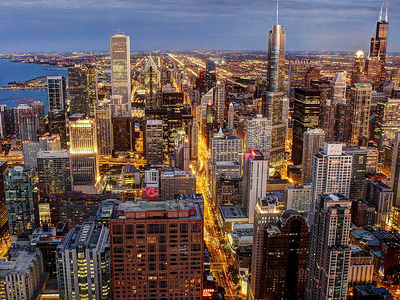 As of 2014, Chicago had the third largest gross metropolitan product in the United States at US$610.5 billion. In 2014, Chicago hosted 50.2 million international and domestic visitors. Chicago's culture includes the visual arts, novels, film, theater, especially improvisational comedy, and music, particularly jazz, blues, soul, gospel and house music. The city has many nicknames, the best-known being the Windy City. Chicago has professional sports teams in each of the major professional leagues. In 2014, Chicago attracted 50.17 million domestic leisure travelers, 11.09 million domestic business travelers and 1.308 million overseas visitors. These visitors contributed more than US$13.7 billion to Chicago's economy. Upscale shopping along the Magnificent Mile and State Street, thousands of restaurants, as well as Chicago's eminent architecture, continue to draw tourists. The city is the United States' third-largest convention destination. A 2011 study by Walk Score ranked Chicago the fourth most walkable of fifty largest cities in the United States. Most conventions are held at McCormick Place, just south of Soldier Field. The historic Chicago Cultural Center (1897), originally serving as the Chicago Public Library, now houses the city's Visitor Information Center, galleries and exhibit halls. The ceiling of its Preston Bradley Hall includes a 38-foot (12 m) Tiffany glass dome. Grant Park holds Millennium Park, Buckingham Fountain (1927), and the Art Institute of Chicago. The park also hosts the annual Taste of Chicago festival. In Millennium Park, there is the reflective Cloud Gate sculpture. Cloud Gate, a public sculpture by Indian-born British artist Anish Kapoor, is the centerpiece of the AT&T Plaza in Millennium Park. 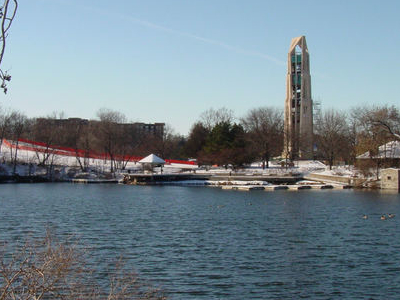 Also, an outdoor restaurant transforms into an ice rink in the winter season. Two tall glass sculptures make up the Crown Fountain. The fountain's two towers display visual effects from LED images of Chicagoans' faces, along with water spouting from their lips. Frank Gehry's detailed, stainless steel band shell, the Jay Pritzker Pavilion, hosts the classical Grant Park Music Festival concert series. Behind the pavilion's stage is the Harris Theater for Music and Dance, an indoor venue for mid-sized performing arts companies, including the Chicago Opera Theater and Music of the Baroque. 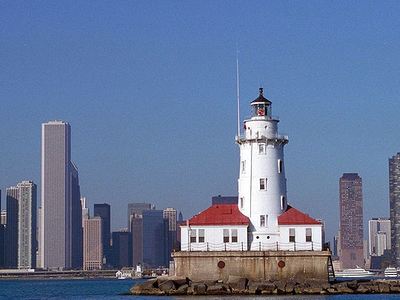 Here's the our members favorite photos of "Cities in Cook County". Upload your photo of Chicago!